2P START! Live! : New Super Koopa Bros. Edition | 2P START! Ray and Tim discuss the shortcomings of New Super Mario Bros. Wii, Tony Hawk Ride’s price problem, where you can find the Zone40, and how you can get a discount on our new shirts! 2. I’m over the age of 18 too, by the way. 20, to be exact. …I kind of wonder how old you guys are. I just realized I don’t know. 5. Oh man. We’ve already got Wii knock-offs in the Netherlands, sold by respected toy stores. It’s pathetic, really. Totally agree with number 4. Though I prefer the original Paper Mario. I died like two seconds into Super Mario RPG and was like “Well forget this!”. 1. Though I haven’t played NSMB Wii, judging from the videos I’ve seen, I completely agree. 2. Since everyone else is naming off their ages, I’m 21 (and am not a fan of “adult humor” either). 4. The first two Paper Mario games were awesome, but I didn’t like the changes made for the Wii one. Mario RPG was okay though — not good, not bad, just okay. That’s because they were referring to Kvb’s post and didn’t have a reply to #3. I remember there’s a flash game in NG that features a Koopa adventure. Video games that doesn’t allow reviews? I’m not gonna buy ANY of those. Aw. The podcast is up early and I don’t have time to listen to it. Oh well. I’ll listen to it at my normal time then in the afternoon. Cool, I sounded less awkward than I was afraid I would. It was kind of a surreal experience doing a call-in, though as we got into the conversation I got less nervous by kinda forgetting we were doing it for a podcast. Speaking of which, NPG! Very interesting discussion of New Super Mario Bros. Wii; you pointed out some improvements that could be made that I might not have thought of before. I certainly agree that if the series does multiplayer again, they seriously need to look at Mario 2 for character choice. I always played as the Princess in that game because her floating was so useful. Besides, she shouldn’t always have to be the damsel in distress. Maybe next time, everyone can go rescue Toadsworth or something. Nice to see someone else in virginia beach! I’m 30. I really hope I’m not the oldest person who comments on this site! If it helps you can just think of me as two and a half 12 year olds. I find I spend more time buying games than actually playing them 🙁 I have this real urge to grab every interesting new release, but half of them end up sitting on a shelf unplayed. Or in my steam account… Seriously, I have over 150 games in my steam account and fewer than 20 I’ve actually completed. Oh why must you have such great sales Valve? Curse you! Other than to complain (once again 🙂 that it’s two Toads and not Wario & Waluigi, my only other complaint about the game is also not being able to play as Luigi in single player. That was always my preference in the older games, whenever possible, even when there was no jumping advantage to playing as Luigi. Even in the original SMB I’d start a 2P game and just kill off Mario! (mwahaha) And, though disappointed that Yoshi doesn’t stick around, it doesn’t seem to bother me as much as I’d’ve thought. I was just happy that my instinct to eat a flying hammer and toss it back proved to be an actual useful tactic when I first found Yoshi. Also, that isn’t the first time CVS has had that stupid thing in their ads and I thought the exact same thing when I saw it weeks ago. A well-deserved Black Doom Award. Also, also, yeah, at 28, I find it harder and harder to commit significant blocks of time to gaming. And RPGs in particular are hard to keep going. I’ve been working on Dragon Quest IV for about a year now, technically…. but shorter pick-up-and-play type games like Rock Band, Mario, and most XBLA titles tend to fit in nicely. WISE FWOM YOUR GWAVE! I’ve actually been listening to this podcast recently, after your interview on Villainy Inc, and I must say this is the perfect podcast to listen to while I do chores. I also love the music in the background–I just knew someone else loved Jet Set Radio Future! My comment’s getting a bit long, so I guess I’ll just say WISE FWOM YOUR GWAVE IS WISE FWOM YOUR GWAVE-TASTIC!! This is why I consider 2P Start to be in a bit of a Pixar audience as far as webcomics go… except with more of Super Smash Bros. Brawl demographic (still not sure why the game got a T rather than E10, but meh…). So wait, does it count as rising from my grave if this is technically my second post but the first one ddn’t go through for whatever reason? Eh. Anyway, I’m a big fan of the comics and podcasts, and would like to congratulate you guys on making such entertaining things in both forms of media. I especially enjoy the podcast’s tendency to make little passing references to jokes from previous podcasts, like the iPhone apps mentioned… a podcast ago? Two? Whatever. I also especially appreciate the discussions you have on the podcasts, like last week’s on Up. It is incredibly refreshing to see you guys’ different takes on the same “issues”, and to hear you discuss them on the podcast. You all are really good at covering several sides of a subject in that way. And for what it’s worth, you totally should’ve found a way to stick the “no cutting” pun in the Mega Thanks comic. It would’ve been AWESOME. Not a whole lot to say, but what’s wrong with Raving Rabbids? Geez. Those games are pretty awesome if you ask me. And I seriously disagree about the placement of the checkpoints in NSMBW and I haven’t even played it. Extending the distance between the checkpoints is an extremely arbitrary and frustrating way to make games more difficult and it’s one of the reasons I don’t like 2D platformers. So, we saw that Tony Hawk Ride pretty much bombed…so why is Natal going to be better exactly? Oh and I’m probably one of your younger readers at 17, but yeah, I think the majority of your readers are above 18. Natal? That’s a completely different beast. There’s a lot of potential there. I read a lot of comments that completely misunderstand what Natal is. Half of the time people think it’s just a webcam, the other half think it’s a full body motion controller. Really it’s both and more. What you have with Natal is a 3d camera and a bunch of clever software that can read faces, interpret voices, detect body positions in 3d space and more. And because Natal generates a 3d point map you can get 1:1 motion in 3d space from multiple players with a single device. That’s rather special. 1) Full body tracking. You can’t kick a ball on the Wii without taping a wiimote to your leg. You can’t use your arms to steady yourself in ride. Natal could potentially do both of these and more. 2) Working to compliment the traditional controller. You could be playing a first person shooter with a normal controller, then make a “move forward” signal with your left hand and watch your squad mates advance out of cover. Swirl a finger in the air and they regroup. You could even have limited head tracking allowing you to lean around corners by tilting your head. That could be massive for immersion. I guess that’s why I like 2P START! It’s funny, clever, intelligent, and it doesn’t insult or offend me in any way. To me, this website is one of the few great places out there on the internet. Well, great podcast guys and keep up the good work. Sorry for the long post. I totally agree. Although I do watch many shows that are currently running (and I mean MANY), I do not watch any of the ones you have mentioned (including The Simpsons). And I’ve never seen Superbad, but from what I know, if that defines our generation, I am even more worried for the world than I was before. And I’m pretty much in the same boat with music. The only slightly mainstream person I listen to is Carrie Underwood and I much prefer her “Jesus Take the Wheel”s and “Temporary Home”s to her “Before He Cheats”s and “Last Name”s. The rest of the music on my iPod is pretty much all contemporary Christian. My favorite web comics? Obviously this site, Awkward Zombie, and F@nboy$. The common denominator? A lack of raunchy jokes. I actually felt weird getting Modern Warfare 2 because I felt like I was falling into a stereotype of teenage boys who enjoy M games and killing people in such games, when in reality I was actually interested in the story. Psst…Brawl in the Family is family-friendly too. And they actually update unlike F@nboy$ and Awkward Zombie (both of which I enjoy as well). But seriously, the BitF guy was hesitant about using the word “crap” once, so I think it’s safe. Also, they recently had one of the most epic web comics ever. Seriously, everybody should go check that one out, but be warned that music will try to load when you visit the page (it’s worth it, though). The music is the whole point. A truly fantastic 200th comic. Bitf is one of the comics I check regularly, I can also recommend it. It isn’t generally up to the standard of 2P Start, but it does post more often. Trade offs, I guess. Yeah, but the thing is, you shouldn’t have had to feel weird when you picked up the game. I will admit, I felt a bit awkward when I picked up my copy. The bad part about picking up games at stores is that whoever is helping you out might judge you. Of course, I once got a nice employee who actually had the same interests in games, so that worked out. Otherwise, I still get funny looks from certain employees when I purchase games – Modern Warfare 2 included. 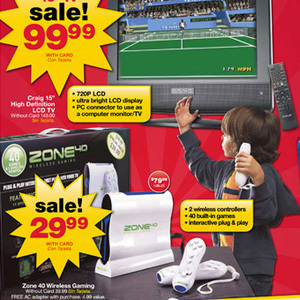 Man, the more I hear about NSMB Wii, the more tempted I am to buy it. I’ve been quite hesitant about it though — in part because a 2D-platformer console game nowadays just feels cheap to me somehow, like it shouldn’t be worth a whole $50 (probably because of the simplicity of the game overall). But Ray says it’s good, Tim says it’s good, and the original seven Koopalings are returning (some of my favorite Mario villains), so maybe it is worth checking out after all. I think you mean the Koopa Kids. Nintendo may be trying to hide their past, but it must not be forgotten! And on a somewhat related note, the Toad’s names are Bucken-Berry (blue) and Ala-Gold (yellow). Even if it’s not official, they should be addressed as such. Koopalings, Koopa Kids, meh semantics 😛 Though I usually associate “Koopa Kids” with those Baby-Bowser look-alikes from the Mario Party series, and (speaking of Nintendo hiding their past) I’m just used to hearing Mario say “Koopalings” in the Hotel Mario intro cutscene. I am not sure what the big deal is with the koopa kids/koopalings. I honestly couldn’t care less. I would just like the bosses to be more varied. Most of the bosses are very similar in NSMBW. The Koopa Kids added some personality to the series back in SMB3 and SMW, though I feel the cartoon series did more in that regards than the actual games. I remember I had a choose-your-own adventure book that was specific to facing off against Ludwig Von Koopa. All that cross-marketing back then helped to make the tiny details of a game more fleshed out than it actually was in-game. So now I’m a little disappointed so far that in NSMB they are simply a face attached to a sprite that you bop three times ’til done. As excited as I am to see them back, it feels more stale than I had hoped. Yeah, the Koopa Kids are a disappointment. I’d like to face bosses with lots of variety (like Mega Man or newer Zelda games). 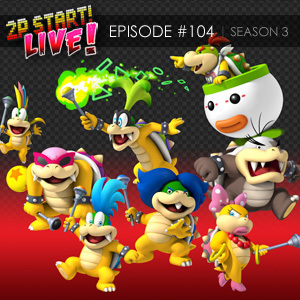 The Koopa Kids might as well be Bowser Jr. each time. 1. I don’t really see how you wouldn’t understand the joke, even if you’re not American. 3. Sonic playing guitar? Do you want to experience Sonic Underground all over again?!? 4. I reviewed Sonic Unleashed! “Revive or Rehash?” XD. Those things are absolutely horrible. Why not just put a short summary of what you thought of the game? Ray, say what you will about Crush 40, but you know this song is totally awesome. I’m honestly going to pay for that song if it becomes available. Also, you might as well throw that in as a Musical Misfit if it qualifies. Yeah, that song is great. It’s kind of funny, someone once said that Crush 40 would be more popular if they were NOT associated with Sonic games. Then again, they didn’t have to name their new CD “The Best of Crush 40 – Super Sonic Songs.” Hey, has anyone heard it yet? It’s actually not bad. There’s some great stuff going on with that song, all though I prefer the demo’s version which didn’t include vocals. Are we sure that one is done by Crush40 though? LOL! Busted up with laughter at that part. And though I see what you guys are talking about regarding NSMB Wii, after playing through about 33% of the game so far, it seems to me that certain parts of the design philosophy in this game are a bit different to accommodate more than one player. But, I have the feeling you’re getting at something different, like how Zelda: Four Swords Adventure required multiple players to get through the game, which is why they had to still give you four Links in single player (man, I’m starting to wish for another Four Swords game right about now…). Granted, Four Swords was a very different beast, requiring separate hardware for its design to even work. I gotta say that Crush 40 isn’t all that bad in my opinion. Sure their new stuff hasn’t been so good, but Live and Learn and Open Your Heart are still really awesome songs. I think that crush 40 music is incredibly bad, but many of their songs are still fun to listen too. They are one of those groups that I only listen to with headphones because I would be embarrassed to actually admit I like that music. Kind of like my small collection of J-pop and rap I like despite it clearly being bad music. 1) As for the ‘cheating’ with multiple players that Ray mentioned, you could even do it worse… Suicide for the coin and then hit the A button to become a bubble. Realllly used that quite a bit. While playing with my girlfriend, we both often ended both being bubbles. Easy way to not lose lives, just your current power-ups. 2) As for Yoshi in NewSMBWii, he was a tad overpowered. BUT he should have gone into more levels still. With a reduced flutter jump, or just the slight ability to float a little longer, I think Yoshi would have fit better into the game. Sort of how in Super Mario World, Yoshi was only in a few levels throughout the game and was never in castles/ghost houses. To just do the same thing that Yoshi could do back then, and apply a slight flutter to him, I think would have worked wonders and actually allowed Yoshi to be used in more than the 4 or 5 levels he was in. 3) The SMB2US character traits would have been a nice touch to add to the NewSMBWii. Heck, even Toadette over the second Toad would have been a great improvement. 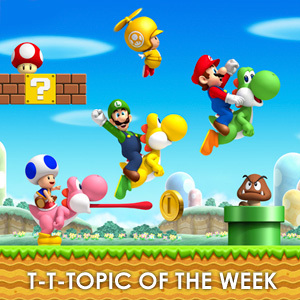 Personally, I would have loved the choice of Mario, Luigi, Wario, Waluigi, and then Toad and Toadettte for character choices to have been a very effective way to broaden the game out and make it less restricted. Either way, its a great game, even if the controls are waaay too loose, until you get used to them. Oh yes! 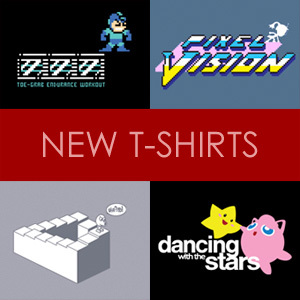 Pixel vision, which i like to describe as the Spinal Tap o video games finally has a shirt. Tim, there is somehting that you are blatently wrong about on the podcast. There IS a game that has parts of levels that you need 2/3/4 players to do. LittleBigPlanet has some stages with parts that require you to use 2/3/4 players to get the prize bubbles. They aren’t the most complicated of challenges, but they’re still 2/3/4 player challenges. I don’t remember saying that a game like that doesn’t exist, just that NSMBWii doesn’t do that. I could be wrong though. If I decide to listen to my own podcast this week, I’ll let you know what I meant by what I apparently said. I’m technically a new member so I guess I’ll STAY OUT OF MY GRAVE… I had seen the comic on random forum sites and never thought to look at all the other comics that site might have. I really love that you are a family friendly web-comic . You don’t need to have profanity and vulgarity in something to make it funny. Continue making great comics and rock on.